I was almost named Carmen. So I was this close to having a Nars lipstick with a shade in my name. Granted, I probably won't ever come across anything with my name on it but that doesn't stop me from appreciating shades of beautiful lipsticks. 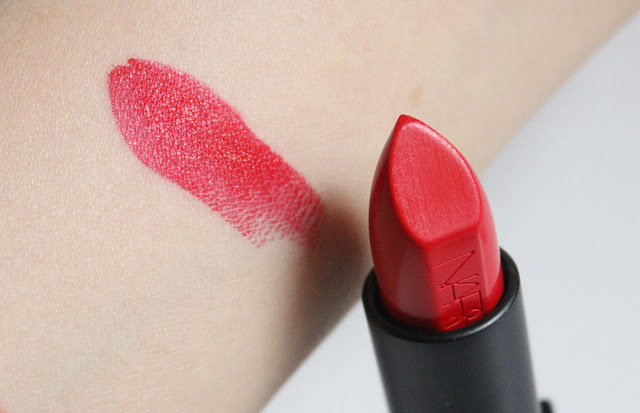 This is my long overdue review of the Nars Audacious Lipstick in Carmen, a true classic red. The Nars Audacious Lipsticks launched last summer and every blogger and their mom has raved about the formula. I purchased two shades, Carmen and Julie, back in March but somehow lost sight of these in my collection. What everyone says about the Nars Audacious Lipstick formula is true. The lipsticks have an opaque, demi-matte finish. One swipe and you have a hyper-pigmented pout. Another great thing about this line is that there are over 30 shades to choose from. Carmen is one of the Barneys-exclusive shades in case you were trying to find this at Sephora. In terms of lasting power, this lipstick lasts at least three hours on me without fading but if I eat, it will wear slightly. I have no problems applying lipbalm over top and reapplying the lipstick though. The lipstick doesn't feel very drying but it can feel slightly tight after a few hours so I recommend prepping the lips with a balm beforehand. The lipsticks are packaged in a weighted black case with a metallic closure and I like that they didn't put their signature rubber packaging on the outside. I one of Nars' regular lipsticks and the case is very grubby because it scratches easily and attracts dust and shimmer. 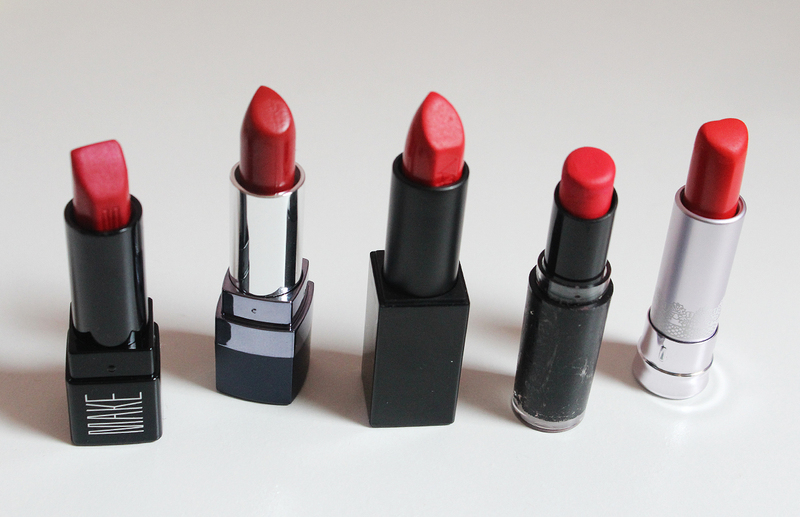 I pulled a few red lipsticks from my collection to give you an idea of how Carmen looks compared to more cool or warm reds. From left to right we have Make Maraschino Cherry, Marcelle Amour, Nars Carmen, Wet n' Wild Red Velvet and Holika Holika Tomato Red. Each of the swatches above is one swipe straight from the lipstick bullet. I tried to position the lipsticks from cool to warm going left to right. You can see Nars Carmen sits in the middle. 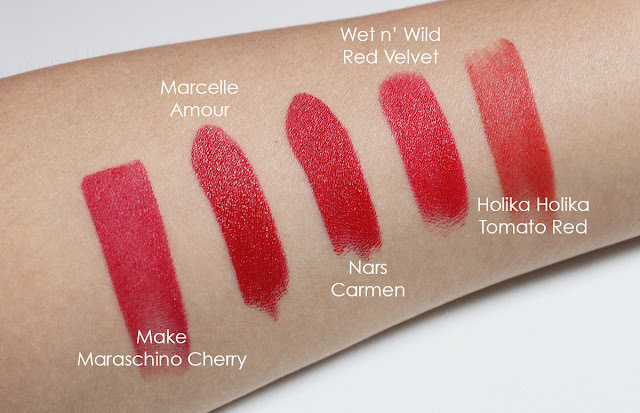 Whereas Marcelle Amour has a shiny, wet finish and Holika Holika Tomato Red has a flat matte finish, Nars Carmen straddles between the two extremes and looks vibrant yet not glossy at all. It's really a perfect red in my book. 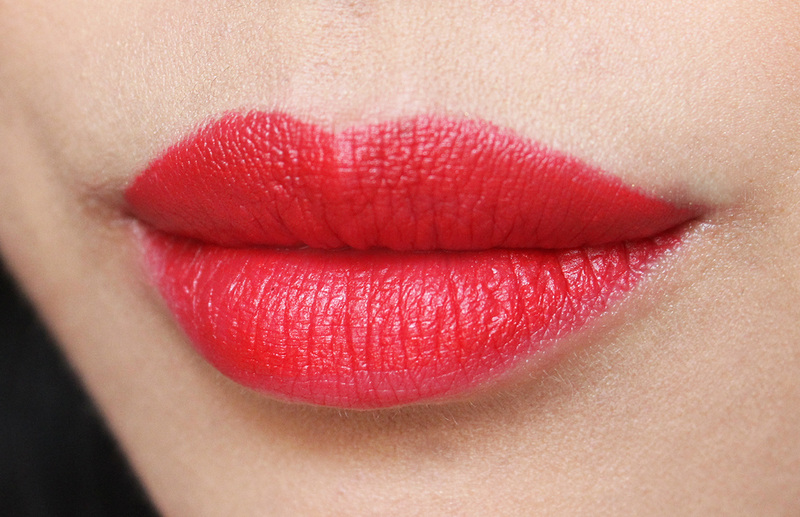 I'm a fan of Nars' Audacious Lipstick in Carmen as it's a classic red that will work on so many people. If you're looking for an investment red lippie to treat yourself to, check out Carmen. I don't wear it nearly as much as I should but when I do, I always tell myself I should wear it more often.